TMS Entertainment USA announced today that the latest installment of the Lupin 3rd series, LUPIN THE 3rd Part 4, will launch on Adult Swim on Saturday, June 17th. It will appear in the weekly TOONAMI programming block. LUPIN THE 3rd Part 4 (26 x 30-minute episodes) is the latest series with Lupin trying to outmaneuver MI-6 throughout Italy! The story that began in San Marino will now expand all over Italy as Lupin pursues love and freedom in this exciting new adventure. While Lupin deals with a motley crew of unique characters that come his way, an extraordinary genius that lived centuries ago steps out of history into his life. 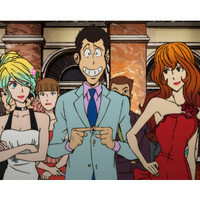 Lupin The 3rd is one of the most well-known animated TV series in Japanese history. It debuted fifty years ago in 1967, as a Japanese Manga series written and illustrated by Monkey Punch. The series follows the escapades of master thief Arsène Lupin III, the grandson of Arsène Lupin, the gentleman thief of Maurice Leblanc's series of novels. The TV series followed in 1971, with the broadcast starting on Japanese TV and became a very popular long airing show. "Lupin is a cool, comedic, and attractive character; I have watched the show since I was a child. The style has not changed and it is still my favorite show. We are so excited about launching on Adult Swim to celebrate the 50th anniversary," said Masami Tokunaga, Vice President of TMS USA. "We are planning a lot of marketing activities for Lupin's 50th anniversary, along with this new broadcast and would like to expand Lupin in various ways in the US." LUPIN THE 3rd Part 2 was on Adult Swim a decade ago. Now Part 4 is here! Get ready for the long awaited return of Lupin and his gang! The English dubbed version is only available on Adult Swim. The LUPIN THE 3rd Part 4 English subtitled version is on Crunchyroll, video streaming service. FEATURE: Head Space - The Steady March of "Tsukigakirei"